Stems: Twining or climbing, bristly hairy. Leaves: Alternate, simple, on stalks 2 to 5 inches long, egg-shaped to nearly circular in outline, 2 to 5 inches long, about as wide, prominently 3-lobed, rounded between lobes, hairy; bases heart-shaped; lobes pointed at tips. Inflorescences: Cymes of 1-6 flowers, on stalks 2 to 4 inches long. Flowers: Sepals lanceolate, densely covered with long hairs, tips usually curved; corollas funnel-shaped, 5 lobed, 1 to 2 inches long, blue, dry purplish; tubes white to pale yellow inside; stamens 5, white, about 2/3 length of corollas. Fruits: Capsules, rounded; seeds 4-6, black to dark brown, densely pubescent. Habitat: Disturbed low areas, roadsides, cultivated fields, and ditches. 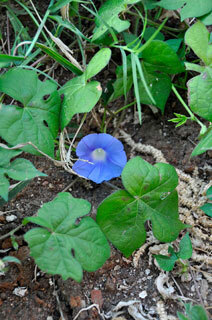 Origin: Ivy-leaf morning-glory is a native of tropical America. Forage Value: Pheasants and quail eat its seeds.